PROFLEX™ 90 is a specialized soundproofing product, intended for use under tile, stone and hardwood finished floors. 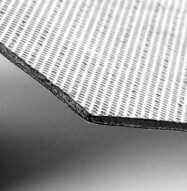 Constructed of a rubberized membrane that is laminated to a high strength, reinforcing fabric on the face and a siliconized release sheet on the adhesive side, PROFLEX™ 90 is a 90 mil composite that is specially designed to be used under approved thin-sets, mortars, and adhesives for interior and exterior applications of ceramic tile, stone, and brick, and for interior applications of wood flooring to help eliminate the occurrence of cracks and to reduce sound transmission. Specially formulated as a powerful soundproofing material for placement under stone, tile and hardwood floors, Proflex 90 is composed of a rubberized membrane laminated to a strong, reinforcing fabric on one side and a silicone-based release sheet on its adhesive side. It’s also 90-mil composite-ready for use on approved thin-sets, adhesives and mortars for exterior and interior applications of brick, stone, tile, ceramic and wood flooring to reduce risk of cracks and dampen sound transmissions. Easily install Proflex 90 by simply peeling and placing Proflex 90 where you want it. Just roll out Proflex 90, measure what you need, cut the measured piece and peel off the protective backing. 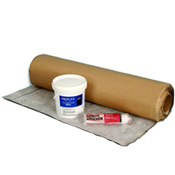 Bond the membrane to sub-flooring using a heavy roller and install your floor-covering materials. Proflex 90 controls joints less than 3/8” wide, effectively bridges cracks and eliminates the transfer of any cracks to finished flooring materials. Proflex 90 is not sensitive to temperature, humidity or other environmental conditions. You can install Proflex 90 indoors, outdoors and in locations regularly exposed to moisture. A reinforced, self-bonding sound reduction membrane that forms permanent bonds to steel, concrete and wood substrates, Proflex 90 is also compatible with most urethane, epoxy and cementitious adhesives. Based on materials and systems implemented during the installation of fin­ished flooring products, Proflex 90 provides limited warranty terms (up to 10 years). Another benefit of using Proflex 90 is its thickness. Because it’s 90 mils, DIYers only add a little bit of height to their floor. This can develop into a major problem when you’re renovating, but with Proflex 90, there’s no need to trim doors or waste time doing additional work just to include awesome sound insulation in your project or home. Now for the technical stuff: Proflex 90 has an Impact Insulation Class (IIC) rating of 68 and a Sound Transmission Class (STC) rating of 72. Tested according to regulations set by the American Society for Testing and Materials Standards E90-02, E989-89 and E492-90, Proflex 90 testing was done on an 8” concrete slab with an acoustic ceiling. Proflex 90 is the leading choice in soundproof membranes for subfloors. Call Soundproof Cow today at 1-866-949-9269 and enjoy the “quietness” of your next new construction or renovation project. Dimensions 3 ft. x 33.3 ft.
Low quantities available, please call to order. Dual Soundproofing Function — PROFLEX™ 90 reduces noise from impact, such as foot fall, and reduces airborne sound transmission, such as noise from voices, TV’s and stereos. PROFLEX™ 90 has an Impact Insulation Class (IIC) rating of 68 and a Sound Transmission Class (STC) rating of 72. Please see the Technical Data sheet for more information. Ease of Installation — PROFLEX™ 90 is a peel and place application which decreases installation time. Simply roll out the product, measure and cut, then peel the protective backing and place. A heavy roller is then used to properly bond the sound control membrane to the sub-flooring. It is recommended that PR11 Water Based Primer be used before PROFLEX™ 90 is installed to seal flooring substrate. Once applied, there is no waiting time for the installation of floor covering materials. Protects from Cracks — PROFLEX™ 90 bridges cracks and controls joints up to 3/8” wide, eliminating the transfer of cracks to the finished flooring. Not Condition Sensitive — PROFLEX™ 90 may be installed in interior and exterior locations, as well as locations which are exposed to moisture. In-stock — We stock all advertised sizes of PROFLEX™ 90. Most products are shipped the same day they are ordered and arrive at your project in three business days, depending on location and size of order. May be applied over properly prepared substrates including (but not limited to): concrete slabs; pre-cast panels; lightweight toppings; patching, leveling, and repair compounds; cement backer boards; terrazzo; ceramic tile; plywood; OS. 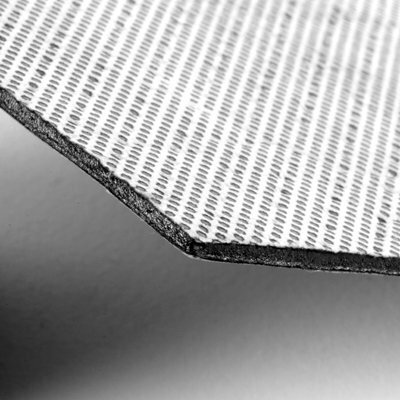 PROFLEX™ 90 is a self-bonding, reinforced, 90 mil-thick elastomeric crack isolation and sound reduction membrane. The membrane forms a permanent bond to concrete, steel, or wood substrates and is compatible with most cementitious, epoxy, and urethane adhesives. PROFLEX™ 90 bridges cracks and controls joints up to 3/8” wide, eliminating the transfer of cracks to the finished flooring. PROFLEX™ 90 is specially designed to be used under approved thin set mortars and adhesives for interior and exterior applications of ceramic tile, stone, and brick, and for interior applications of wood flooring. Other applications also may be suitable, please contact our acoustic Consultants for additional information. PROFLEX™ 90 sound reduction properties are for floors requiring a minimum Impact Insulation Class (IIC) of 68 and Sound Transmission Class (STC) of 72, as tested in accordance with American Society for Testing and Materials (ASTM) Standards E90-02, E989-89, and E492-90. Testing for PROFLEX™ 90 was conducted on 8” concrete slab with an acoustic ceiling. PROFLEX™ 90 offers limited warranty terms up to ten (10) years, based on the system of materials used to install the finished flooring products. Contact us for specific warranty terms and conditions. Substrate must be primed with PROFLEX™ Primer. Protect Primers from freezing. Follow PROFLEX™ installation instructions, all TCNA (Tile Council of North America), NWFA (National Wood Flooring Association) technical specifications and guidelines. Consult with manufacturer of thin-sets, mortars, and adhesives to determine compatibility with their product. Mortars shall be at a minimum ANSI 118.11 specification. Impervious tile (less than 0.5% absorption) may require a 48-hour cure prior to grouting. The mortar will be sandwiched between two non-absorptive materials and will require additional cure time. Cooler weather will also increase set time. Not for use over expansion joints (structural design joints) or structural (out-of-plane) movement cracks. Not recommended for use on concrete floors when hydrostatic pressure is present. We recommend testing the substrate prior to installation of product using a Calcium- Chloride (CaCl) test kit. Maximum 1/4” seam for crack isolation. Perimeter expansion of 1/4” minimum must be maintained for warranty. My neighbors elephant feet were killing me. Every time he would walk I would hear it throughout my condo, so I agreed to pay for half to get it fixed. He was heart set on tile flooring so I had to find something to work underneath that. I was told about the Proflex and I’m glad I went with it, it’s been awesome. I don’t hear him at all anymore.